One day, as he stood at his lathe with an orange inferno raging before him I asked him about the glasses he was wearing. 'Didymium' he answered cryptically, and then noticing my blank look, he added 'cuts out the light. Try them.' He passed me his specs, the lenses of a curious greeny-grey colour. I slipped them on and suddenly the flame was gone. All I could see was a red-hot piece of spinning glass unobscured by the glare. I gawped in wonder until Geoff pulled the specs off my face saying 'give 'em back ya fool' and went back to his work. Didymium is not a name you will often find in textbooks these days. 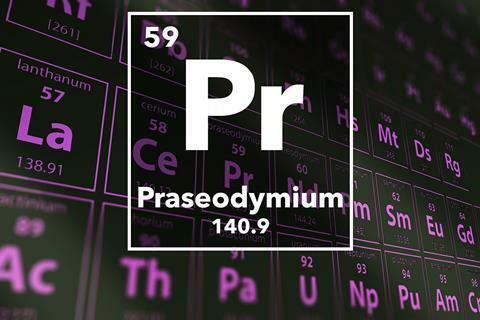 It is the name of a pair of elements which lie next to each other in the lanthanide or rare earth series – what used to be the wild west of the periodic table. The fourteen elements that constitute the series are remarkable for their similarity. Nowhere else does one find a group of elements that so resemble each other in their chemical properties. Hence these elements proved incredibly difficult to separate from each other and purify. And to make matters worse, unlike other metals, the colours of rare earth metal compounds were pale changed little from one compound to the next, making it even harder to work out whether your material was pure. 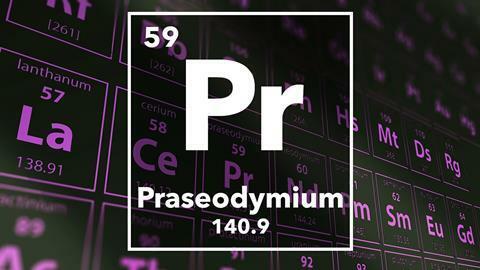 Amongst the many claims for the discovery of new elements was a report in 1839 by the Swedish chemist Carl Gustav Mosander of a supposed element he called didymium – after the Greek word for twin. Bunsen, who, by the 1870s, was the world's leading authority on the spectroscopy of the rare earths set this element as a problem for one of his students Carl Auer, who began to carry out the hundreds of fractional crystallizations necessary to get it pure. By 1885 it was clear that Auer had not one but two elements on his hands – a bluish lilac one he called neodymium, the new twin - and a green one he named praseodymium – the green twin, each with their own spectra which summed together were the same as those of Mosander's material. Bunsen was delighted and immediately gave his approval to his student's work. But I'm sure you really want to know is, if this really is the M & M element, what does it taste like? I knew you would ask. So I had a quick lick a couple of days back and the answer is it doesn't actually taste of very much to be honest. There's a faintly astringent and metallic taste which lingers on your tongue for few hours. And when it is molten – sorry I'll leave that experiment for someone more intrepid than I.